The Laguna Beach Rotary Club has honored Charlie Hoffs for her outstanding achievement in English at Laguna Beach High School. She has learned to speak Chinese and recently won the International Chinese Language competition in Kunming, China. 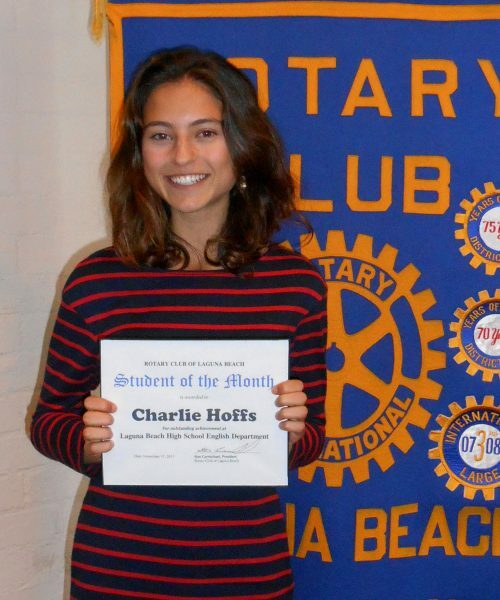 Charlie is secretary general of LBHS Model United Nations program, president and founder of The Global Outreach Club as well as a National Merit semi-finalist. Charlie hopes to attend Harvard University and spend a year at Beijing University, studying environmental science and public policy. Eventually she would like to be a diplomat working in foreign service.